by Rob - June 13th, 2014. 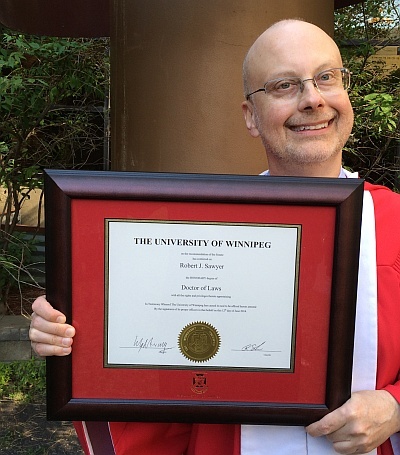 On June 12, 2014, the University of Winnipeg — the oldest university in the province of Manitoba, Canada — gave bestselling science-fiction writer Robert J. Sawyer an Honorary Doctor of Laws Degree; former Canadian Prime Minister Jean Chrétien also received the same degree that day. Sawyer was nominated for the honorary doctorate jointly by the Dean of Science, Dr. James Currie, and the former Dean of Theology, Rev. Dr. James Christie, in part in recognition of the thoughtful treatment of the science-and-religion dialogue in Sawyer’s work. This was Sawyer’s second honorary doctorate; he also holds an Honorary Doctor of Letters degree from Laurentian University in Sudbury, Ontario, awarded in 2007.